The early days of the year see Colonsay quiet, with essential work on the farms, the comings and goings of the ferry, and the occasional hardy beach comber the only visible signs of life. There can be no relief from serving the needs of the island’s cattle and sheep, but for all else, superficially at least, this is a time when everything seems quiet. Those that can fly south do, if not for the winter, then at least for a few weeks of tepid sun. The majority, though, have to make do as best they can, dealing with the worst of weather and the short dark days, and even if not on show there is still work to be done. The children are at school, new homes are being built, the surgery is busy with winter ailments, and the shop is even more a lifeline with disruptions to ferries bringing erratic deliveries and occasional shortages. This is island life at its simplest and most vital, basic living proving a toil with only a little relief. The Colonsay Hotel, generally closed for the winter, opens its bar for a few hours each weekend so that stories, laughter and the news, fake or not, can be shared and savoured, while The Pantry, the island’s main café, opens on “ferry days” around boat time to lift spirits on grey days. Life on the island can be hard, but the mutual support of the community is still present, and it is a time when spare energy can be put into helping community activities, which have more attention through the quieter winter months. The Colonsay Community Council (CCC) and Colonsay Community Development Company (CCDC) both continue to be active in addressing the community’s needs. The CCC is the island’s primary route for island-wide consultation, and lobbying on shared issues, and continues to address such things as broadband availability and the island’s ferry service. The CCDC looks to develop projects of benefit to the community, which currently include improvements to recycling and a play park for young children. The CCDC held an open day with a drop-in café on 18th November 2017, to give local people an opportunity to share their current thoughts about important issues for the island and their hopes for the future. In January, the CCDC published a newsletter capturing people’s feedback from the open day. The full newsletter is available from the CCDC office, while the Corncrake editor’s summary is presented here. In the newsletter CCDC says that the participants’ views and suggestions have helped the CCDC refresh its vision for the island, and this renewed vision will form the basis for an updated business plan. The CCDC intends to develop this into a revision of the 2012 Community Plan. The newsletter goes on to highlight issues that residents raised, with housing being people’s greatest concern. The CCDC say that resolving the current situation presents many challenges, is their number one priority, and that they are hopeful that the Port Mor Housing project move forward soon. The provision of business facilities is closely linked with housing, and so is also being addressed by CCDC. Broadband was another issue that has been highlighted by people as a major problem. This is already being addressed by the Community Council as mentioned above/below. Availability of community owned assets and community led projects also came out as an important factor in forming a positive future for Colonsay. One important asset, is the community website, “colonsay.org”, and this site now requires re-development to make it compatible with mobile and tablet devices, to have a more contemporary look and feel, while establishing its unique identity on the web amongst other Colonsay websites. On other existing initatives, the Play Park project is still ongoing, with more work to do to fulfill the planning requirements with regard to road safety, i.e. fencing and road signs. Once these have been resolved installation of the equipment can proceed. Also, public internet access is again available at the Service Point. Kilchattan School winter newsletter gives an insight to life there, and Corncrake is delighted to present a summary here. The children of Kilchattan School celebrated Christmas with Advent Calendars from Gavin at The Pantry, a Christmas Lunch, and a Carol Concert. The traditional Christmas Lunch included a turkey provided by Grace and Keir, and the staff and pupils are especially grateful to Jodi for doing all the extra cooking. The Christmas Carol Concert brought much praise, and the after school music club run by Shonagh has impacted extremely positively on all the pupil’s musical ability. This term the children have been doing an interdisciplinary Viking project coordinated by Ms Dance, and showcased their learning by writing a play called “Sunshine on Leif”, which they performed to parents and members of the community. Throughout the project pupils have developed skills in non-fiction writing, including writing recipes for Viking bread, which they put into practice with delicious results. All children have successfully completed Scottish National Standardised Assessments in reading, writing and numeracy. As part of Remembrance events the children had a talk from Liz Gibson and then visited the war memorial in Scalasaig with Jim Johnstone to lay poppy crosses. Jeremy the Policeman came into school to talk about keeping safe online. The pupils will be continuing with CEOP (Child Exploitation and Online Protection) awareness. The Parent Council arranged and funded a very enjoyable trip for the pupils to Glasgow during which the children went to see a pantomime, visited the Christmas Market, enjoyed “soft play” and went to the cinema. On the journey over, the children were invited to visit the bridge on The Clansman, which gave them a real insight to all that happens behind the scenes on our ferries. The children have been very successful in raising money for Children in Need this year, wearing something spotty on the day and collecting round pounds. They raised £104.25 for Children in Need. The current revival of the Burns Night Supper continued this year with the event held on Saturday 27th January, attracting over 40 hearty diners. David Binnie presided over the event with The Haggis being provided and cared for by Ross Moody and Gavin Clark, and the Selkirk Grace delivered by Donald MacAlister. All the usual offices were well served with Dougie Reid delivering the Address to The Haggis, Sue Dance with the oration to the Immortal Memory, Richard Buttrick the Toast to the Lassies, and Tanya Wren the Reply to the Gentlemen. With Jan Brooks’ rendition of the Burns song “The Silver Tassie”, and the Colonsay Choir leading all present in Auld Lang Syne the evening was thoroughly enjoyed by all those present. Kevin Byrne has been gathering data and campaigning for some time to have an upgrade to the island’s broadband service. The CCC has received a report that BT intend to upgrade the shared bandwidth for the island’s broadband from 8Mb to 20Mb, which will significantly increase the shared data rate available to the community. Considering the very low data rates experienced by some homes, particular those at a distance from the telephone exchange, it will be interesting to see the practical improvement brought by the upgrade. At least, some progress is being made. 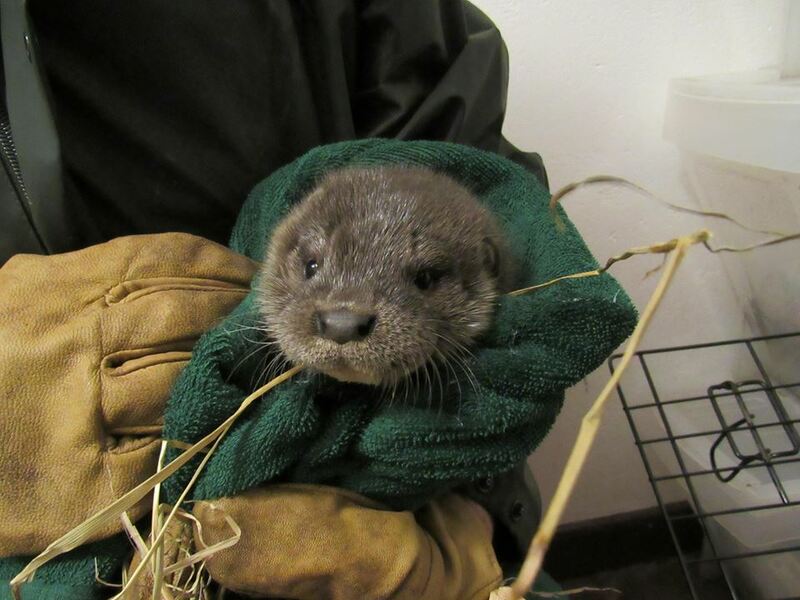 An otter cub found on Oronsay was successful transferred to a rehabilitation centre on the mainland, thanks to willing hands transporting the youngster as an unexpected passenger on Calmac’s Colonsay to Oban ferry. The cold, wintry weather in late February brought a bitter chill to the island, with the ground and streams frozen. For livestock, particularly cattle, this is a serious issue and farmer and crofters on the island needed to make special efforts to provide water to their animals. The cold also brought a need for extra heating and with the older houses using traditional heating this meant an additional demand for coal and logs. 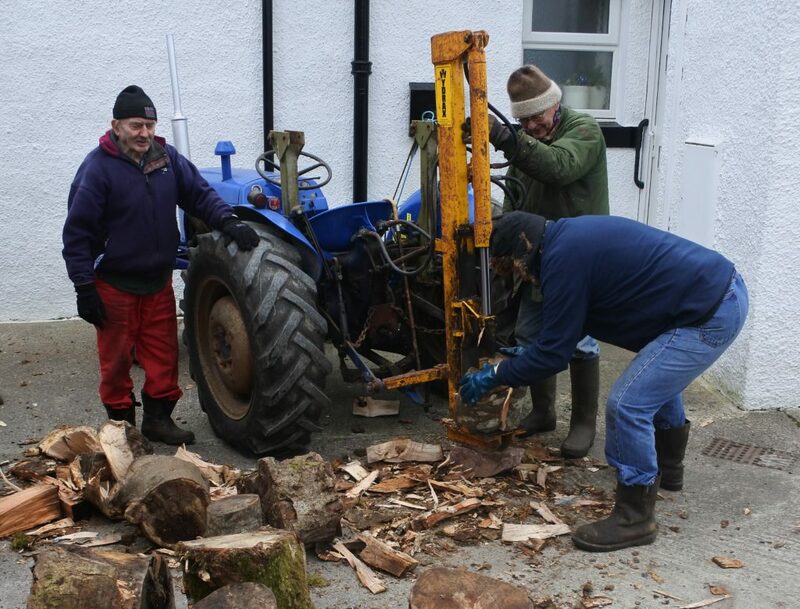 Up in Uragaig, neighbours John Bridges and Douggie Reid stepped in to split logs, so the Walter Williams had sufficient supplies to keep heating and hot water going.